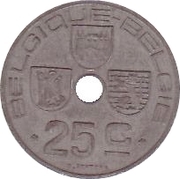 Monogram of Léopold III around center hole, date below. Coats of arms of Brussels (left), Mons (middle) and Bruges (right) surrounded by bilingual legends. Value and designer below. The 1941 and 1947 coins are not mentioned by Morin, just by Krause; these coins appears to have been minted but never left the vault of the National Bank of Belgium and were melted.